The dermatology industry is experiencing a drastic shift from traditional documentation, patient management, and care methods to intelligent dermatology software and advanced dermoscopy tools designed to enhance care, streamline workflows, and optimize patient outcomes. Learn about the top 4 dermatology features set to be the next revolution in the field of dermatoscopy. 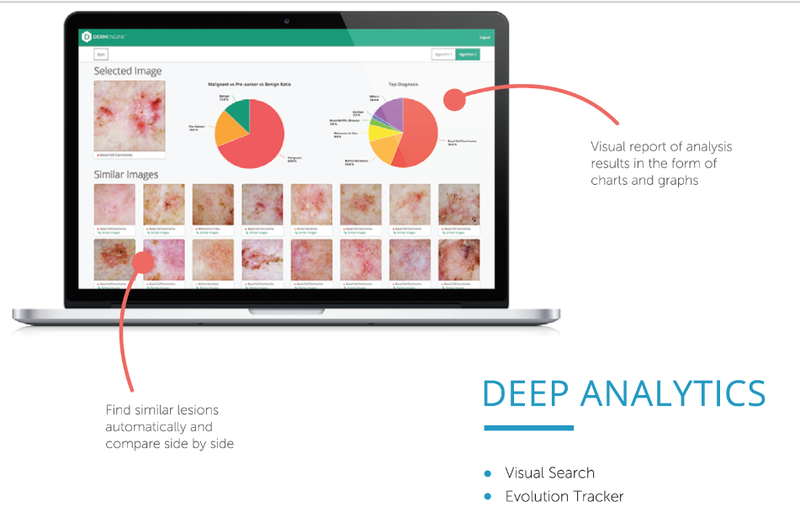 Additionally, smart dermatology tools like DermEngine's Visual Search are extremely valuable as an educational resource; dermatologists gain access to a database of pre-labelled images from around the world that can support the training of medical students, researchers, or non-expert physicians. As an example, studies demonstrate that the primary obstacle for a higher rate of professional dermoscopists is the limited training methods. Due to its wide accessibility to resources and comprehensive imaging, dermoscopy tools such as Visual Search prove to be a valuable educational tool. Teledermoscopy is experiencing increasing usage due to its ability to offer affordable, streamlined, and accessible care to patients at all times and locations. This is especially important due to the fact that countries such as Canada are experiencing a shortage of dermatologists with typical wait times of at least six months. By utilizing teledermoscopy software, medical professionals are able to provide accessible care, increase patient engagement, reduce unnecessary in-clinic visits, reduce patient wait times, and provide a comprehensive report within minutes. In turn, this allows dermatologists to provide streamlined care while allowing the professional to focus on their patients. Total body photography (often called total body imaging, full body imaging, or full body photography) allows dermatologists to manage high-risk patients through the sequential imaging of the patient's skin. Total body photography software supports dermatologists in the early detection of skin cancer by notifying them of any new or changing spots to further simplify image comparisons. 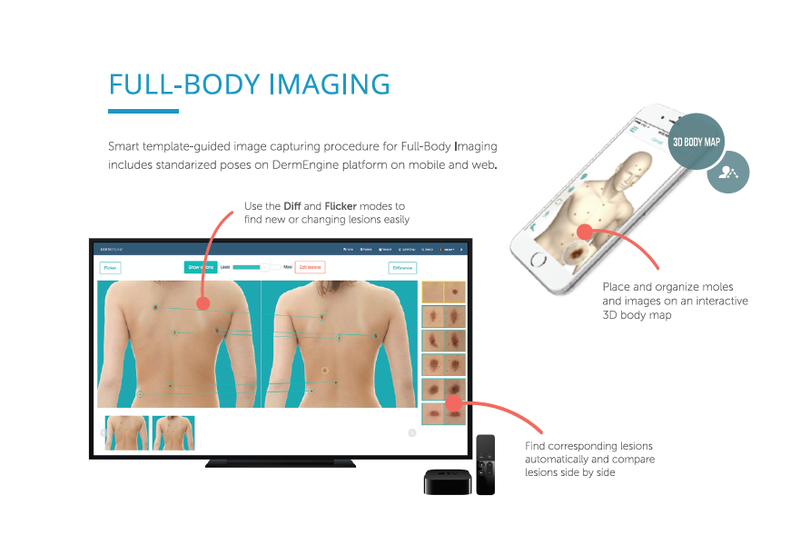 For example, DermEngine's MoleMap allows dermatologists to map spots to the patient's personal 3D Body Map to save time and streamline the documentation process. Additionally, the software's MoleMatch feature identifies lesions in an image and uses advanced algorithms to match the correlating spots between consecutive images while allowing you to flicker between images to detect any new or changing lesions for supported care. Projected to skyrocket to a value of $24.55 billion by 2021, clinic data analytics is a quickly growing area of interest for business intelligence in dermatology and the broader healthcare field.1 Clinical analytics holds the potential to help a practice determine the best treatment for patients based on their personal health data. This expands into improved prevention, diagnosis, and follow up care for patients’ conditions. Connected areas of interest include interoperability, big data, Cloud-based EMR software, and predictive analytics. Intelligent dermatology software such as DermEngine expand on these concepts though offering integration with the current EMR/PMS software of a clinic. This in turn prevents any disruption or miscommunications with previous healthcare systems to ensure that meaningful data is extracted to ensure that dermatologists maintain access to essential data in a convenient, centralized location. The field of dermoscopy is experiencing a digital health revolution as dermatologists are shifting towards utilizing the latest intelligent dermatology software and tools. Only four of these advanced dermoscopy support tools include content-based image retrieval (powered by artificial intelligence/AI), teledermoscopy, clinic analytics, and total body photography. Together, these advanced skin analytics tools work together to ensure a comprehensive experience ensured to enhance care, streamline workflows, and optimize patient outcomes.